After twelve years of its existence and during which period, the ‘Second Bank of the United States,’ ruthlessly manipulated the American economy to the detriment of the people but to the benefit of the banksters’ own money-grabbing ends, the American people unsurprisingly were tired of all the deception. Opponents of the bank nominated Senator Andrew Jackson of Tennessee to run for President. He was no friend of the Rothschilds and he had no love of their central bank system either. Immediately upon his election to the highest office, he set about bringing-down the bank and eliminating all Rothschild’s many placemen in the government’s ‘service.’ In order to illustrate how deeply this ‘cancer’ was intertwined within government circles, he dismissed 2,000 of the 11,000 employees of the US Federal Government. Congress was of course unable to override President Jackson’s veto who then stood for re-election and for the first time in American history he took his argument directly to the people by taking his re-election campaign ‘on the road.’ His campaign slogan was, “Jackson and No Bank!” Even though the banksters poured over $3 million into President Jackson’s opponent, the Republican Senator Henry Clay’s campaign, Jackson was re-elected by a landslide in November 1832. He appointed Roger B. Taney as Secretary of State for the Treasury with instructions to commence the removal of the government’s deposits from the Second Bank of the United States. Jackson’s previous two Secretaries of State for the Treasury, William J. Duane and Louis McLane had both refused to comply with the President’s request and were dismissed as a result. However the President of the, Second Bank of the United States, Nicholas Biddle, used his massive influence to get the Senate to reject Roger B. Taney’s nomination and even threatened to cause a depression if the Bank was not re-chartered. In simple terms he was in effect threatening to instigate a recession by withholding the printing of currency – as was his prerogative of course. After all, the Second Bank of the United States was responsible for the entire economy, totally free from any possible government intervention. This statement alone is proof enough to the world what central banks are really all about. He actually made good on his word and the Second Bank of the United States sharply contracted the money supply by calling in old loans and refusing to issue new ones. 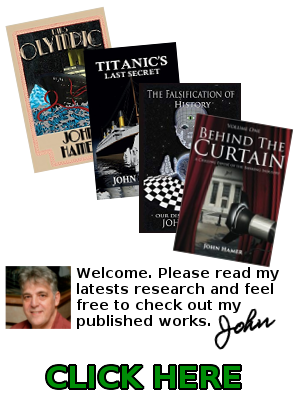 Naturally a financial panic ensued, followed by the US being plunged into a deep recession. Biddle then unashamedly blamed President Jackson for the crash, claiming that it was Jackson’s withdrawal of federal funds that had caused it. This crash decimated wages and prices and unemployment soared, along with business bankruptcies. The United States was in uproar and newspaper editors blasted the President in editorials. So, in 1834 Congress assembled what was known as the ‘Panic Session’ and on the 28th March, President Jackson was officially censured by Congress for withdrawing funds from the Second Bank of the United States, in a vote which was passed by the Senate by 26 to 20. It was the first time a President had ever been censured by Congress. When Jackson took office the national debt of the United States was $58 million, six years of his Presidency later, the debt was zero. Jackson was the only American president to achieve this feat and this was the one and only time that the United States of America was debt-free. Unfortunately, this debt-free America lasted a mere one year only. On 30th January 1835 President Jackson set another, this time unsought precedent, when he became the first American President to be targeted for assassination. Indeed, the unemployed housepainter Richard Lawrence was also setting a precedent in being the first of a long, long series of so-called ‘lone nut’ assassins. 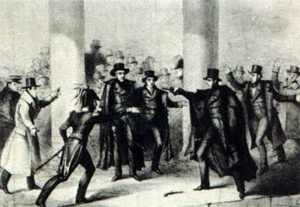 He approached Jackson outside the House Chamber of the Capitol with two Derringer pistols, taking his first shot at thirteen feet but fortunately for his intended target the percussion cap exploded but there was no discharge. The outraged 67 year old President raised his cane ready to strike Lawrence as he fired the second pistol close up against Jackson’s chest, but it misfired yet again. 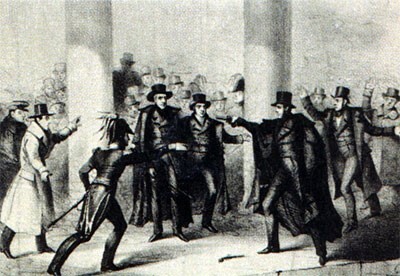 Jackson then beat his would-be assailant with his cane but was interrupted by none other than Senator Davey Crockett of Tennessee, who was to lose his life at the Battle of the Alamo in the following year. It must indeed have been divine intervention that saved the President from death, after ironically attending the funeral of South Carolina congressman Walter R. Davis. Jackson’s courage was legendary; he had stared death in the face on many occasions, both in battle and in numerous duels of honour. Almost one hundred years later in 1930, the two pistols were tested by the Smithsonian Institute and both of them fired normally on the very first attempt. Lawrence was declared insane, as is the general way of things, and later died in an asylum. Jackson sincerely believed, and with good cause, that it was the Rothschilds who made use of this ‘useful idiot’ lone-nut assassin. 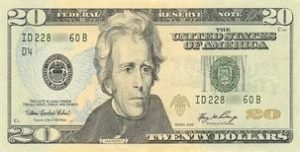 Yet the last word, the last ironic insult, was the banksters’ ‘honouring’ of Jackson by featuring him on their $20 dollar bill many years later, after the creation of their highly criminal enterprise, the Federal Reserve Bank.